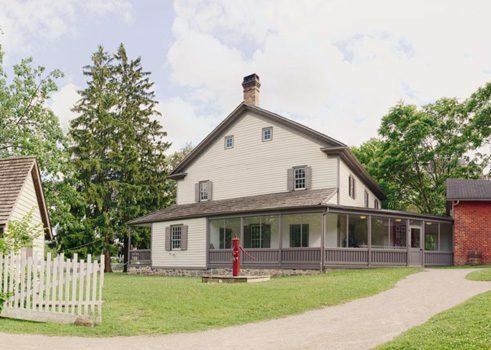 The property includes a farmhouse, three outbuildings, and a garden, and is a living museum dedicated to recreating life in mid-19th century Kitchener. 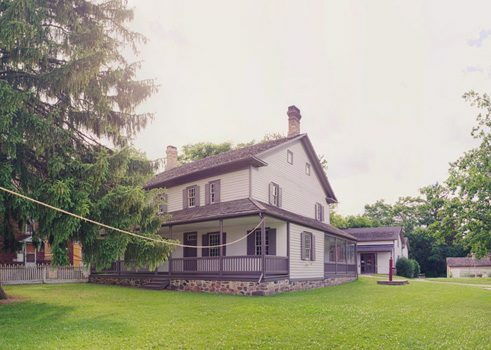 Staff dressed in period clothing work around the house, demonstrating tasks like cooking and sewing using tools that would have been familiar to the inhabitants in 1856. Joseph and Barbara Schneider, the original owners of the house, were some of the first non-Aboriginal settlers in the area. The Schneiders were Mennonites, a religious group originally from Germany and the Netherlands who are traditionally pacifists. Joseph Schneider was born in Lancaster County, Pennsylvania in 1772 to German parents, and he married Barbara Schneider, née Eby, in 1798. Lancaster County today has the largest Amish settlement in the world and still has a fairly large population of Mennonites, but in the years following the American Revolution, many of the Mennonites living in Pennsylvania wanted to remain under British rule. The current-day Waterloo region had inexpensive land and was relatively remote, so the German-speaking Mennonites could continue to practice their religion and language. In 1807, a group of Mennonites including the Schneiders moved to what is now Kitchener. Joseph Schneider contributed a lot to the early settlement, and is seen as one of the founders of Kitchener, along with his brother-in-law Benjamin Eby. He assisted in building the first road in the area, hiring a teacher for the first local school, and constructing the town's first Mennonite meeting house, among other things. In 1816, not only did he build the “Schneider Haus”, he also built a sawmill. The creek it was located on what is still called Schneider Creek. The Schneiders were central figures in developing the community, and their son Joseph Eby Schneider continued to work at the sawmill and on their farm after their death. "Schneider Haus" is set up to represent life for this second generation in Kitchener. Kitchener-Waterloo and the surrounding region still have a significant Mennonite population, as evidenced by Mennonite stores and churches in the cities and their farms dotting the countryside. Near Waterloo is the St. Jacob's Market, the largest farmer's market in Canada, where visitors can buy Mennonite products and produce. The “Schneider Haus” commemorates some of the first members of this founding community of Kitchener-Waterloo.